Why do these people hate children so much? What do they not understand about the word happy? This assault on freedom began with the kooks in San Francisco and now has inevitably led to a lawsuit. McDonald’s Corp., the world’s biggest restaurant chain, baits, exploits and ultimately harms children by offering toys with its “Happy Meals,” a Washington-based consumer advocacy group claimed in a lawsuit. The Center for Science in the Public Interest, in a complaint that its litigation director Stephen Gardner said was filed today at a state courthouse in San Francisco, accuses the company of deceptive marketing and business practices. The filing could not immediately be confirmed. “I don’t think it’s right to entice children into wanting Happy Meals with the promise of a great toy,” plaintiff Monet Parham said today in a telephone interview. The case was filed by her on behalf of her 6-year-old daughter, Maya. Right, like the six-year-old has the slightest clue what's going on. But it's typical of these people to shield themselves behind little kids. Look, my kid enjoys Happy Meals as much as the next kid, but even he knows the toy is a throwaway for the most part and it might occupy him during his meal and on the way home. Beyond that, unless it a car giveaway tied to a movie, he's probably never going to play with it again, so unless your kid is deprived at home, he or she isn't going to think some cheap piece of plastic is a "great toy." Let's face it, the kids want the burger or nuggets along with the fries. They're there to eat, not to stock up on toys. As for this Parham woman, if she had the slightest clue and wasn't looking for a payday she'd understand she can opt to not have the toy, or take her kid elsewhere. Parham, 41, lives in California’s capital, Sacramento, and said she is a state employee. “We are proud of our Happy Meals and intend to vigorously defend our brand, our reputation and our food,” the company said in an e-mailed statement responding to the lawsuit. The center seeks class-action, or group, status on behalf of all of the state’s children under 8 years of age who have seen marketing for the company’s packaged children’s meals since December 2006. It also seeks an order barring the company from continuing to promote meals featuring toys on television, billboards and in its restaurants. There is no demand for money damages. “The lawsuit is about the change, not the money,” Gardner said in a phone interview. I hope McDonald's countersues for harassment and legal fees. That would put an end to this nonsense. By the way, I've noticed Wendy's and Burger King also give away toys to kids. Why are they not being sued? Update: To no surprise, there's an obvious political agenda here. 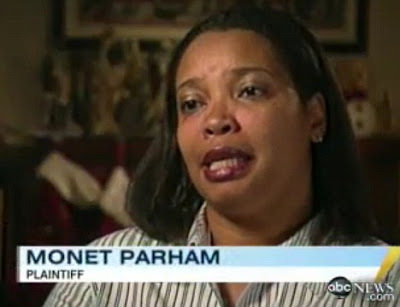 Much of the interviewing press was happy to treat Monet Parham as a random (if oddly well-informed) California mom, but it didn’t take the blogosphere long to discover that she is apparently anything but random. Ira Stoll, who blogs at Future of Capitalism and used to put out the New York Times-tweaking smartertimes.com, soon discovered (via a commenter) that she is in fact the same person as Monet Parham-Lee, who is a “regional program manager” on the state of California payroll for child nutrition matters. “Interestingly, her name has been scrubbed from the website of Champions for Change, the Network for a Healthy California. She has given numerous presentations and attended conferences on the importance of eating vegetables and whatnot. Monet Parham-Lee serves has a Regional Program Manager within the Network for a Healthy California; a program of the California Department of Public Health funded by the USDA-Supplemental Nutrition Assistance Program (formerly the Food Stamp Program). She spends most of her time at the Network providing consultation, technical assistance and on-going support for the Regional Networks which facilitate the full integration of a variety of State Network-level functions on the regional level, bringing services and support closer to Network-funded projects and partners serving the low income audience. Ms. Parham-Lee also serves as the Network's lead staff person on early childhood matters, working closely with several Network funded Statewide Leadership Projects focused on early nutrition and physical activity. Prior to joining the Network, she worked in a variety of health services, childrens services, and public health programs at the State-level, as well as with the Greater Sacramento Urban League. Yet she's treated as just some average run of the mill mom. Good grief. Update II: This big lie has made it halfway around the world already and the media are acting as willing accomplices in this fraud.